HAVERING ...Meh: Havering: What would YOU ask the council? Last month's "Ask the Cabinet"
On Wednesday, I'm attending "Ask the Cabinet" at Havering council where we, as residents, have the opportunity to ask our democratically elected leaders anything we like about any issue related to life in our great borough. If you have a question and aren't able to attend, type it here and I will choose my favourite from the list and ask the council myself. Why is there no bus service between Hornchurch/Upminster and Brentwood? It makes travelling there really difficult. Also, a 10 minute car journey from Upminster to Harold Wood, often takes 40 minutes on public transport. It's discrimination against anyone who doesn't drive a car, and stopping everyone else protect the environment! I am concerned about the shortage of primary school places in Havering. This was raised at a previous meeting that I watched on the web cast. 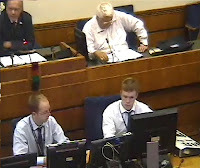 The leader of the council told the lady who asked the question that he was not aware of any serious issues. Just over a month ago I read an article in the Romford Recorder saying the complete opposite ! Is anything going to be done about controlling the speeding cars that drive down Crow Lane and offshoot roads? Recently it's become a speedway for boy racers. We've already had fatalities this year, why don't they finalise the speed cameras they keep threatening to put up, there's just a sign for them, this doesn't deter anyone. A number of people turned up for 'Ask the Cabinet' at Havering Council today and unfortunately it was cancelled without any notice on the website. We were all very disappointed, however I have submitted ALL your questions to a journalist contact who attended the subsequent Cabinet meeting, and I will receive responses for you in due course.